I've been trying to get around a completely automated build process for sometime now. Finally, I got to work out through the details for a recent web application project in .NET. Now that I have most of the things out of the way I suppose its fair to say that its fairly straight forward but an occasional head cracking must happen. I hope that this post might help someone else starting out with CruiseControl.NET. Hm. Not too bad, I suppose. If I can figure out how to throw in an issue-tracking system into the pot and start distributing installer packages with automated release notes that would be just about as far as you can push that thing. But, lets see on the fundamentals first. I have 3 projects in the Visual Studio solution: web app, class library (with the core set of classes) and an NUnit test project. Class library uses Microsoft Enterprise Library 3.1 (May 2007) - specifically its Data and Logging services. Web application references the core class library (just like the NUnit project does). You can see the top-level folder structure for the project. It was inspired by Jean Paul S. Boodhoo's series of articles on automating a build with NAnt. Web application resides in src/app/WebApp folder. Core class library is in src/app/Core and NUnit is in src/test/NUnit. tools/ folder contains NAnt and NUnit dlls. lib/ contains MS Enterprise Library DLLs referenced by the project. build.bat batch file basically calls NAnt passing in the default.build as the build file where all (or most of) the juice happens. This is really the central piece of the puzzle that took the most time, so lets try and explain that bit. 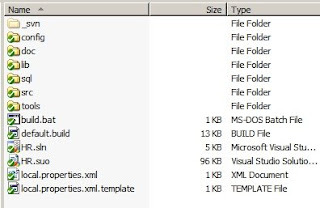 Example above is used to replace various tokens with the values required in the environment where build is taking place. The only difference from the original appearance in Boodhoo's article is in the use of inputencoding="Unicode" in the copy task which ensures that a file that is encoded in unicode gets copied into a file with the same encoding (by default OEM code page is used which means your unicode files become perhap latin-1252 encoded and makes the loose special characters). Local.properties.xml is also used to merge user-specific properties into the build file - things like passwords, paths where SQL Server data/log files are located, etc. The above will essentially change the the ASP.NET version for the virtual folder that was created during deployment through the build script. In my case I have IIS 5.0 with a single instance and my web application's virtual folder name is WebApp. To facilitate selenium testing, I've placed the core selenium files inside the web application as well as a folder with all the tests. selenium is in src/app/WebApp/resources/selenium/core and its tests are at src/app/WebApp/resources/selenium/tests folder. Integrating Selenium into CruiseControl.NET means that the tests should get executed through NAnt. There is a good starting point on how to perform the integration in the OpenQA wiki. Essentially, we'll need a custom NAnt task that executes the selenium tests. I'm using SVN setup on localhost. This is served through an Apache 2.0 (config for that shortly), hence SVN access is through http://localhost/svn-... URL. There are a few NAnt tasks that get executed - in the order specified: db (create database), seed (pump default data), compile, test, ASP.NET compile, deploy and finally selenium. Upon successful builds, source code is tagged by way of actually making a copy of the snapshot of files inside the SVN's [ROOT]/releases/[prefix]. [build] folder. SVN core files are obtained from the SVN's [ROOT]/trunk folder. Make sure you use rootnamespace attribute in your vbc NAnt task. Set it as per what Visual Studio sets it, otherwise you'll get compilation problems. hmmm. perhaps enough for now. Files used here - NAnt default.build. I believe I needed to get the selenium under WebApp so that I can run them through the development web server. If they're under /tests there's no web app to bootstrap them from.